If you’re installing a hardwood floor in new construc­tion, all you have to worry about is the condition of the subfloor. But if you’re working on a remodel project, you’ll likely have to remove an existing floor covering, which might be carpet, linoleum, or vinyl. Removing old floor coverings is my least favorite part of installing wood flooring. No matter how many times a carpet is cleaned throughout its life, removing all the animal dander, dirt, and dead bugs is just about impossible. With that in mind, I always wear a respirator when tearing up old carpet. Unlike dust masks, respirators are certi­fied by the U.S. government to ensure that they meet specified minimum filtration requirements, as well as specific manufacturing quality levels. Also, many dust masks do not seal tightly to the face and allow airborne hazards to pass. When estimating the amount of flooring needed, take into account the shape of the room as well as the flooring direction. Rooms with multiple jogs or bays, or diagonal installations, can result in twice the waste of simpler spaces. Many carpets are held in place by tack strips installed next to the walls. These narrow wooden strips have small, sharp, angled nails that point up to hold the carpet’s backing. The strips themselves are nailed to the floor. 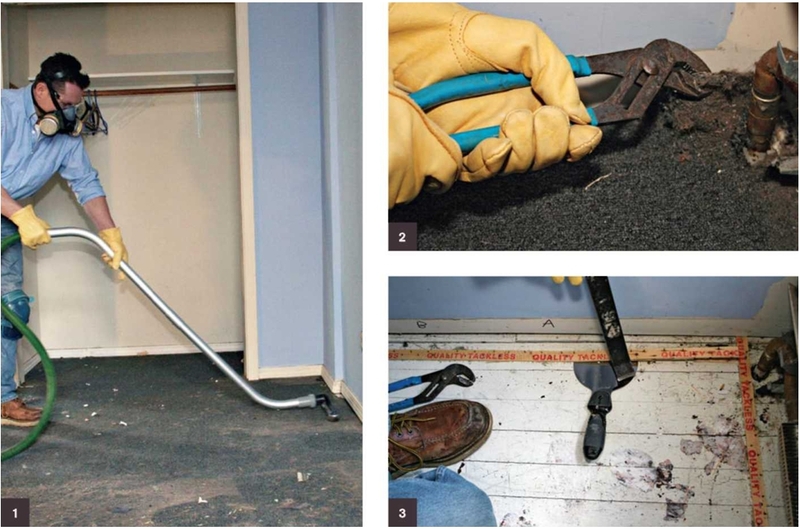 To begin removing old carpet, pull back a corner with pliers. Continue around the outside of the room, releasing the rest of the carpet from the tack strip. Cut the carpet into manageable strips to haul away. If there are existing wood floors under the carpet that you simply plan to refinish, be careful not to damage them while cutting the carpet. Vacuum the subfloor as you remove the carpet strips to limit the amount of dirt that becomes airborne. Once you’ve removed all the carpet, pull up the tack strips using small pry bars, a claw hammer, and pliers. A drywall-taping knife can be placed between the floor and the pry bar to protect the wood floor from damage. A cat’s paw-type nail puller can also be used to remove nails from a stubborn tack strip. Wear gloves while removing the tack strips. The tack strip has sharp little teeth, and at least one will find its way into your fingers.